After setting out to explore wats and city today, I spent an hour talking to 7 young monks/novices todat at Wat Ong Thu! Learning English and studying it there at the table, they invited me to sit and chat. 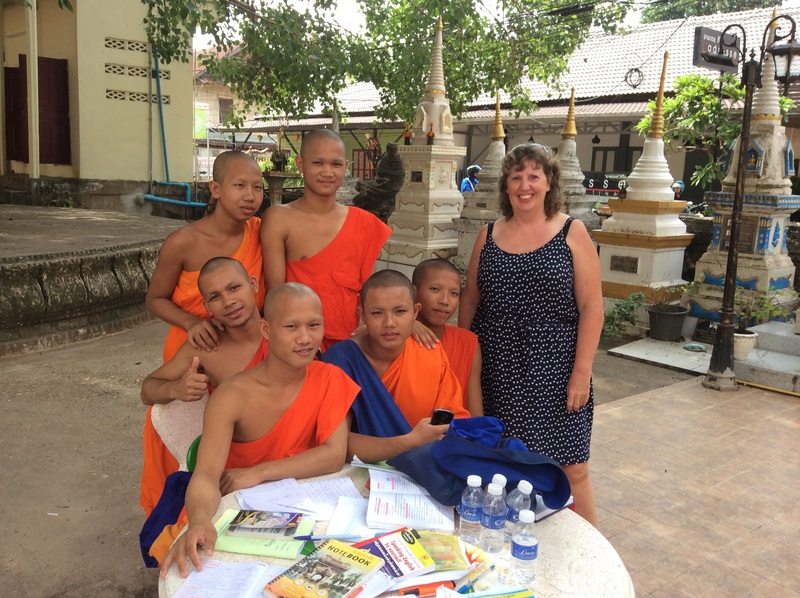 So I met Novice Souk, Soukkhy, Somkit, Boun, Jo, Apple and monk Somsaiy (between 15 and 19). Some of them shy to try to speak but they are very good. Novice Somkit spoke the most confidently – he wants to teach, visit the USA and studies chemistry at college. they go to school too, or college or uni. We asked and answered each others questions, but I remembered so much more I want to know. They have invited me back to pray with them at 5.45 for 6.00 pm, or 3.30 am which I heard this morning at the wat across from me – the gong call to prayers and the drum beat. I now also know how to pray at a stupa – kneel, feet to back, hands together at face/forehead and bend to the floor. They will chant in learned Bali (?) language or Bhudda language maybe. It was so interesting, and good for them. They have added me on Facebook to practice English. So if anyone else wants to as well, they are happy to link. I then bumped into a couple with pram and roller skating child in Union Jack helmet, and stopped to chat. They work here, originally she is English but lived Perth from 11; he is Irish (not English), and their daughter just started at the Vientiane International School. Walking on, I saw three men sat in the shade of trees by the park area. said hi, got chatting and one Belgian, works here since recently, and his American friend Daniel, visiting. The other a native Loa in hos work clothes. We chatted about travels, how to get from here to Chiang Mai by boat and bus, cheaper ways and more fun ways than flying, and how I get around map-less. They find me brave for getting lost and just wandering. They have invited me to the international school picnic at 4-6pm where various denominations meet annually. What fun! My day sorted and how plans are made! Lunch not quite as planned. To early but now hot and ordered meatball for lunch and got raw spring rolls with dip! But my mango shake was yummy!